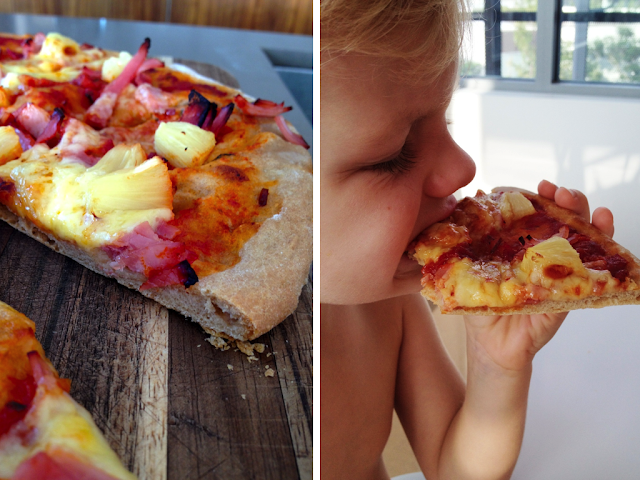 Friday night is Pizza night at our place. And no, I don't dial a 13 number, I use the dial on my Thermomix to create the most amazing home-made pizza bases in just a matter of minutes. The cupboards start getting bare by the end of the week, but there's usually something left there to chuck onto a pizza. We always mix up the toppings for variety, but tonight I thought I'd try using spelt flour (rather than plain white flour) to make up the bases, and I must say I'll be using it again. This ancient grain is currently enjoying a resurgence in popularity due to it's nutritional qualities and appealing nutty flavour. 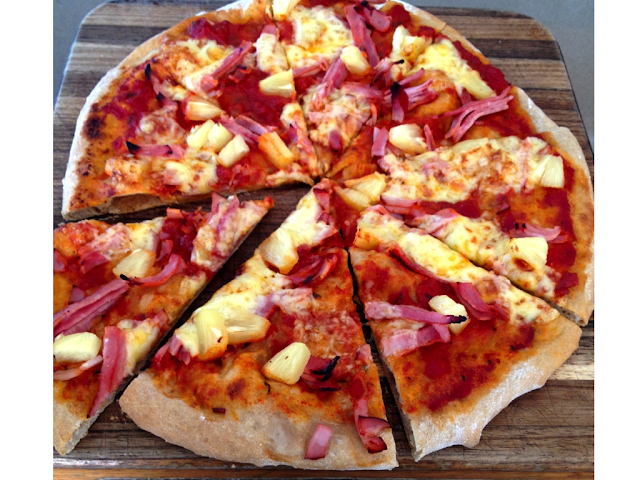 The kids topped theirs with ham and pineapple which went down a treat. We, on the other hand, used a gourmet salami from Eumundi Smokehouse (available from their stall at the Davies Park Markets at West End), some 'shrooms and topped it off with some fresh rocket. And they only take 12 minutes to cook in a hot oven - now that's what I call fast food. Do you have a regular Friday night meal? Everyone keeps talking about these thermomixes, I think I need to check it out! I am hosting a Thermomix demo party next week...I cannot wait to see what it can do! And those pizzas look great! 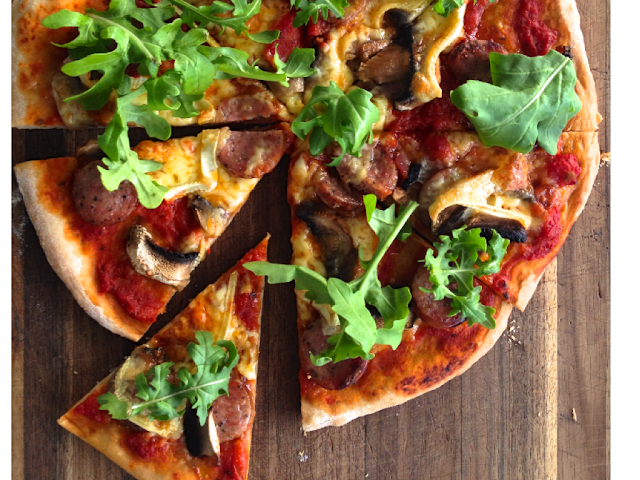 I am so hungry right now and am thinking that a homemade pizza would really hit the spot! Friday nights we always go to Toddler C's godmother's house...she lives right around the corner from us and always puts on a nice spread of nibbles which serve as our dinner! Hmm, that published before I was ready! Oops. Friday night is generally pizza night for us as well and I'm very impressed with the results I am getting from the weber (on a pizza stone) at present since we are ovenless - sometimes a little burn on the bottom but generally great. Yes, and we call it pizza Friday! Every week, everyone in the family should think of a new flavor that we can try. I’m into vegan pizza, and I always top my slices with some of my favorite herbs like rosemary and basil. And of course, tons of gourmet cheese inside and out.